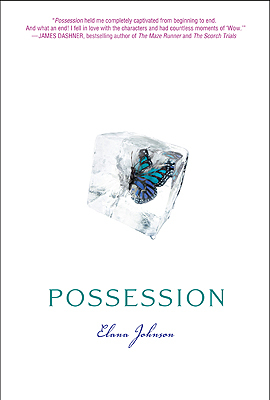 To think for yourself or not think for yourself, that is the question in GCC Member Elana Johnson’s new novel, POSSESSION out this month through Simon Pulse. Because really, who needs to pick their own husband anyway? Elana: Well, I don’t know about funny ha-ha, but we took a road trip one Christmas from Utah—which gets a lot of snow in December—to Arizona, that doesn’t. Our car started making a funny sound, and it turned out that we had to replace all our tires in Kingston, Arizona. Not fun. But we did it. About six weeks later, while I drove to school in 8 inches of snow, I slid right off the road. Turns out that Kingston doesn’t sell snow tires, so I had to replace them again! So not funny ha-ha, but funny nonetheless. Elana: Absolutely not! I actually took the AP English test as a junior in high school so I could skip English as a senior. I majored in Chemistry Education. I switched to Elementary Education with a Math minor, and that’s actually what I earned. So no creative stuff in sight. I wanted to be a teacher when I was a child—and I am! Elana: Nothing. We didn’t really celebrate things like this. Lame, I know. Elana: I’m a complete discovery writer. I don’t like to outline; it steals all the fun from writing. There’s nothing better than drafting with nothing but a wing and a prayer. Elana: I was at home, and I got the email and just about died. Ten minutes later, my agent called. It was a bit premature; we just had interest, but it was serious interest and we had a date the editor was taking the MS to acquisitions. It was our first response, and it was an almost-yes! With the real yes phone call, I was on the phone when my husband got home from work. So I scrawled on a post-it note “Simon Pulse bought my book!” and held it up for him to see. He whisper-screamed. It was awesome.